Classic Monsters Jason: A Souvenir Guide to Friday the 13th - from the UK! MyMovieMonsters.com > Monster Magazine Marketplace > Classic Monsters Of The Movies (UK) > Ultimate Guides > Classic Monsters Jason: A Souvenir Guide to Friday the 13th - from the UK! Direct to MyMovieMonsters.com from the creators of Classic Monsters of the Movies magazine in the United Kingdom: Jason - A Souvenir Guide to the Friday the 13th Franchise 1980-2009. We ship same or next day so don't wait for the UK! Classic Monsters takes a fresh look at one of horror's modern classics with its Friday the 13th franchise magazine guide. The name Jason Voorhees is a byword for slasher horror. This machete-wielding marauder just won't stay down, no matter what you hit him with -- and our dedicated Friday the 13th magazine guide, Jason, explores the reasons why we can't stay away from Crystal Lake. 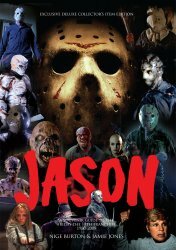 From the beginnings of this classic movie series, through its many twists and turns, to the 2003 crossover mash-up finale, with an extra feature on the 2009 reboot, Jason is the perfect way to rediscover a franchise you thought you knew. A range of absorbing articles looks at each movie in turn, with great stills, facts and trivia giving you a deeper insight into this pioneering series. Classic Monsters looks at Jason's different incarnations over the years, and check out the many teens who have fallen foul of Mr. Voorhees. You may meet some familiar faces! Collectors Note: The publications produced by Stripey Media Ltd., including this Souvenir Guide, have set a new standard for quality. The images posted to our website simply do not do these gems justice. All photos are crisp, pages are colorful! These are a must for any monster magazine collection. While supplies last we also offer issues of Classic Monsters of the Movies magazine, several Ultimate Guides, and The Monsters Day-By-Day Almanac.